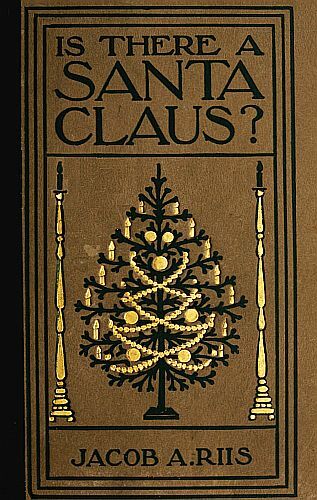 Title: Is There a Santa Claus? That was the message that came to me from an editor last December just as I was going on a journey. Why he sent it to me I don't know. Perhaps it was because, when I was a little chap, my home was way up toward that white north where even the little boys ride in sleds behind reindeer, as they are the only horses they have. Perhaps it was because when I was a young lad I knew Hans Christian Andersen, who surely ought to know, and spoke his tongue. Perhaps it was both. I will ask the editor when I see him. Meanwhile, here was his letter, with Christmas right at the door, and, as I said, I was going on a journey. I buttoned it up in my great coat along with a lot of other letters I didn't have time to read, and I thought as I went to the depot what a pity it was that my little friend's papa should have forgotten about Santa Claus. We big people do forget the strangest way, and then we haven't got a bit of a good time any more. NO Santa Claus! If you had asked that car full of people I would have liked to hear the answers they would have given you. No Santa Claus! Why, there was scarce a man in the lot who didn't carry a bundle that looked as if it had just tumbled out of his sleigh. I felt of one slyly, and it was a boy's sled—a "flexible flyer," I know, because he left one at our house the Christmas before; and I distinctly heard the rattling of a pair of skates in that box in the next seat. They were all good-natured, every one, though the train was behind time—that is a sure sign of Christmas. The brakeman wore a piece of mistletoe in his cap and a broad grin on his face, and he said "Merry Christmas" in a way to make a man feel good all the rest of the day. No Santa Claus, is there? You just ask him! And then the train rolled into the city under the big gray dome to which George Washington gave his name, and by-and-by I went through a doorway which all American boys would rather see than go to school a whole week, though they love their teacher dearly. It is true that last winter my own little lad told the kind man whose house it is that he would rather ride up and down in the elevator at the hotel, but that was because he was so very little at the time and didn't know things rightly, and, besides, it was his first experience with an elevator. As I was saying, I went through the door into a beautiful white hall with lofty pillars, between which there were regular banks of holly with the red berries shining through, just as if it were out in the woods! And from behind one of them there came the merriest laugh you could ever think of. Do you think, now, it was that letter in my pocket that gave that guilty little throb against my heart when I heard it, or what could it have been? I hadn't even time to ask myself the question, for there stood my host all framed in holly, and with the heartiest handclasp. "Come in," he said, and drew me after. "The coffee is waiting." And he beamed upon the table with the veriest Christmas face as he poured it out himself, one cup for his dear wife and one for me. The children—ah! you should have asked them if there was a Santa Claus! Your son is breakfasting with us. We send you our love and sympathy. For, you see, the house with the holly in the hall was the White House, and my host was the President of the United States. I have to tell it to you, or you might easily fall into the same error I came near falling into. I had to pinch myself to make sure the President was not Santa Claus himself. I felt that he had in that moment given me the very greatest Christmas gift any man ever received: my little mother's life. For really what ailed her was that she was very old, and I know that when she got the President's dispatch she must have become immediately ten years younger and got right out of bed. Don't you know mothers are that way when any one makes much of their boys? I think Santa Claus must have brought them all in the beginning—the mothers, I mean. I would just give anything to see what happened in that old town that is full of blessed memories to me, when the telegraph ticked off that message. I will warrant the town hurried out, burgomaster, bishop, beadle and all, to do honor to my gentle old mother. No Santa Claus, eh? What was that, then, that spanned two oceans with a breath of love and cheer, I should like to know. Tell me that! After the coffee we sat together in the President's office for a little while while he signed commissions, each and every one of which was just Santa Claus's gift to a grown-up boy who had been good in the year that was going; and before we parted the President had lifted with so many strokes of his pen clouds of sorrow and want that weighed heavily on homes I knew of to which Santa Claus had had hard work finding his way that Christmas. It seemed to me as I went out of the door, where the big policeman touched his hat and wished me a Merry Christmas, that the sun never shone so brightly in May as it did then. I quite expected to see the crocuses and the jonquils, that make the White House garden so pretty, out in full bloom. They were not, I suppose, only because they are official flowers and have a proper respect for the calendar that runs Congress and the Executive Department, too. I stopped on the way down the avenue at Uncle Sam's paymaster's to see what he thought of it. And there he was, busy as could be, making ready for the coming of Santa Claus. No need of my asking any questions here. Men stood in line with bank-notes in their hands asking for gold, new gold-pieces, they said, most every one. The paymaster, who had a sprig of Christmas green fixed in his desk just like any other man, laughed and shook his head and said "Santa Claus?" and the men in the line laughed too and nodded and went away with their old. ONE man who went out just ahead of me I saw stoop over a poor woman on the corner and thrust something into her hand, then walk hastily away. It was I who caught the light in the woman's eye and the blessing upon her poor wan lips, and the grass seemed greener in the Treasury dooryard, and the sky bluer than it had been before, even on that bright day. Perhaps—well, never mind! if any one says anything to you about principles and giving alms, you tell him that Santa Claus takes care of the principles at Christmas, and not to be afraid. As for him, if you want to know, just ask the old woman on the Treasury corner. And so, walking down that Avenue of Good-will, I came to my train again and went home. And when I had time to think it all over I remembered the letters in my pocket which I had not opened. I took them out and read them, and among them were two sent to me in trust for Santa Claus himself which I had to lay away with the editor's message until I got the dew rubbed off my spectacles. One was from a great banker, and it contained a check for a thousand dollars to help buy a home for some poor children of the East Side tenements in New York, where the chimneys are so small and mean that scarce even a letter will go up through them, so that ever so many little ones over there never get on Santa Claus's books at all. The other letter was from a lonely old widow, almost as old as my dear mother in Denmark, and it contained a two-dollar bill. For years, she wrote, she had saved and saved, hoping some time to have five dollars, and then she would go with me to the homes of the very poor and be Santa Claus herself. "And wherever you decided it was right to leave a trifle, that should be the place where it would be left," read the letter. But now she was so old that she could no longer think of such a trip and so she sent the money she had saved. And I thought of a family in one of those tenements where father and mother are both lying ill, with a boy, who ought to be in school, fighting all alone to keep the wolf from the door, and winning the fight. I guess he has been too busy to send any message up the chimney, if indeed there is one in his house; but you ask him, right now, whether he thinks there is a Santa Claus or not. NO Santa Claus? Yes, my little man, there is a Santa Claus, thank God! Your father had just forgotten. The world would indeed be poor without one. It is true that he does not always wear a white beard and drive a reindeer team—not always, you know—but what does it matter? He is Santa Claus with the big, loving, Christmas heart, for all that; Santa Claus with the kind thoughts for every one that make children and grown-up people beam with happiness all day long. And shall I tell you a secret which I did not learn at the post-office, but it is true all the same—of how you can always be sure your letters go to him straight by the chimney route? It is this: send along with them a friendly thought for the boy you don't like: for Jack who punched you, or Jim who was mean to you. The meaner he was the harder do you resolve to make it up: not to bear him a grudge. That is the stamp for the letter to Santa. Nobody can stop it, not even a cross-draught in the chimney, when it has that on. Because—don't you know, Santa Claus is the spirit of Christmas: and ever and ever so many years ago when the dear little Baby was born after whom we call Christmas, and was cradled in a manger out in the stable because there was not room in the inn, that Spirit came into the world to soften the hearts of men and make them love one another. Therefore, that is the mark of the Spirit to this day. Don't let anybody or anything rub it out. Then the rest doesn't matter. Let them tear Santa's white beard off at the Sunday-school festival and growl in his bearskin coat. These are only his disguises. The steps of the real Santa Claus you can trace all through the world as you have done here with me, and when you stand in the last of his tracks you will find the Blessed Babe of Bethlehem smiling a welcome to you. For then you will be home.